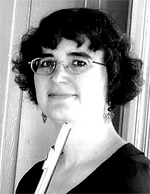 Nancy Hennen holds a Bachelor of Music from Mount Allison University, a Master’s in Chamber Music Performance from McGill, and a MA in Music Criticism from McMaster. She was principal flutist of Symphony Hamilton for 5 years, and has appeared with the symphony orchestras of Niagara, Windsor and Thunder Bay. She has been a flute instructor at the Great Lakes Flute Centre, Hillfield-Strathallan College, Brock University and Lakehead University. She has acted as woodwind adjudicator for music festivals in Kingston, Thunder Bay and Sault Ste. Marie. She is now based in Brandon where she teaches flute in Brandon University’s School of Music, when she isn’t hurrying to keep up with her sons Sean and Marc.